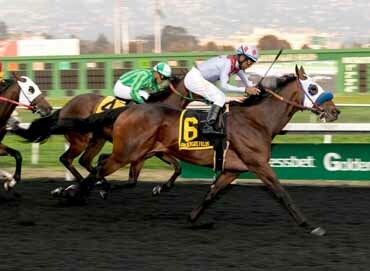 ALBANY, Calif. (Nov. 10, 2018) — Tivan, a 2-year-old California bred gelding, made his first start against winners in the $50,000 Golden Nugget Stakes on Saturday at Golden Gate Fields and passed the class test with flying colors, sitting off the pace before coming with a ferocious rally down the lane to surge past early pacesetter Tribal War Chant in the final yards. Jerry Hollendorfer conditions the 2-year-old gelding, who was ridden to victory by veteran jockey Frank Alvarado. Alvarado celebrated his 50th birthday on Saturday. Tivan is by the late Indian Evening and is out of Zak’s Precocious (Precocity). He was bred by owner KMN Racing LLC. With the Golden Nugget win in his pocket, Tivan has won both lifetime starts with career earnings of $60,350. He completed the six furlongs in 1:09.94. Tribal War Chant, who went off as the 8-5 favorite, dueled on the lead with eventual fourth place finisher The White Shadow and held off Midnight Special for third, finishing three-quarters of a length behind the winner. Daddy Jones and Mad Luther completed the order of finish.